Events professionals joined the team from Grass Roots at the annual Meetings Industry Forum. 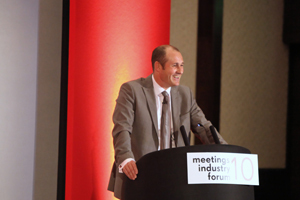 HSBC chief economist Dennis Turner was among speakers from brands including Castrol, KPMG, Morgan Stanley and British Airways at Grass Roots' Meetings Industry Forum. Visit London's director 2012 Games Mark Howell and the Greater London Authority's head of London 2012 unit Dan Hawthorn also shared insights into the Olympics opportunities during the event on Friday (10 September).